Begin and end the day with God and your angels! 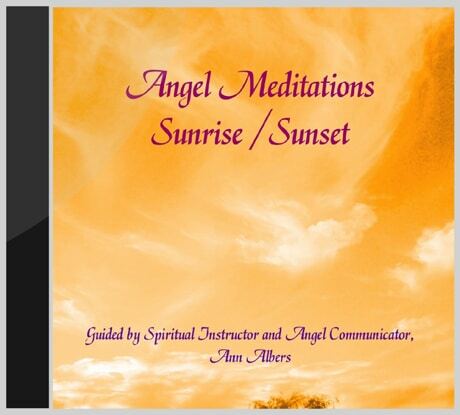 During these guided meditations by Ann Albers and her heavenly helpers you'll energize and uplift your spirit in the mornings, and relax and release the day at night. Begin and end the day with God and your angels. During these guided meditations created by Ann Albers and her host of heavenly helpers you’ll energize and uplift your spirit in the mornings, and relax and release the day at night. Ann Albers is a popular spiritual instructor and author. Track 1 – Morning Meditation: Begin your day by giving thanks to the Divine for the miracle of your life. With the angels, energize and balance your chakras to create physical vitality, peace of mind, and a serene calm in the emotional energy. Bathe yourself in divine light and open yourself to receiving guidance from Spirit in order to create a beautiful day. A great way to start your morning! Track 2 – Evening Meditation: Before you go to bed, clear your mind, calm your emotions, and work with the angels to remove any excess energy or tension from your physical body. Merge with your soul to assess the day from a loving perspective and to allow gratitude to fill you with Divine love. Release any upsets and drift into slumber with a request for inspiration and guidance in your dreams. Music on Track 1 by Grady Soine from his CD “Angel Whispers” ©1993, 1995 Grady Soine. Used with permission. Music on Track 2 by Michael Hammer from his CD “Doorway to the Pleiades” ©1993, 1995 Council of Light. Used with permission.